It isn’t necessary to go far from the city to enjoy some of the best wine and vineyards in Perth. In less than 30 minutes, Top Gun Wine Tours Perth can take you from the bustling city to a relaxing wine tour of some of Swan Valley’s most beautiful vineyards and wineries. What could be more relaxing than a pre-planned, all inclusive getaway that includes some of the finest wines in Western Australia, a premium, two course meal, snacks, transportation, and epic scenery? What is a wine tour? Top Gun Wine Tours allows you to escape the busy city for one day. Instead, we fill your day with exquisite wine, a sumptuous two-course meal, delicious snacks, gorgeous scenery, and a luxurious bus to take you from one spot to the next in wine country. Where do wine tours go? Top Gun Wine Tours will collect passengers from two locations. From there our tours take you to a number of wineries, which can vary depending on the day of your tour. Sandalford Winery – This award winning winery pours tastings of premium wine, served with cheese. Swanbrook Winery – In addition to tasty wines, this winery offers wine-infused sorbet! Mandoon Estate – A TWO-COURSE meal at this delectable restaurant (with a great view!) is included in the tour. Olive Farm Wines (Tuesday and Thursday) – Watch wine being made through the 180 degree viewing station as you sample wines here. 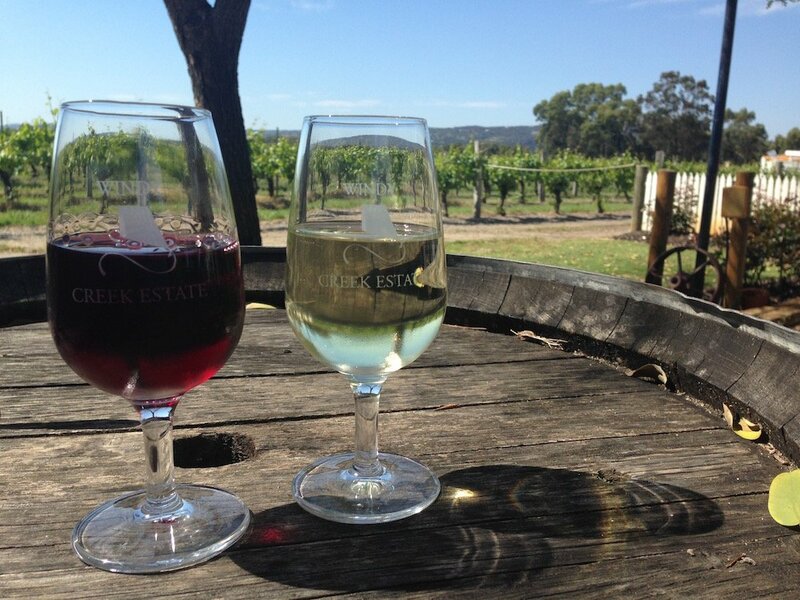 Jarrah Ridge Wines (Saturday) – Wine tasting here includes a great view of the gorgeous vineyard. Sittella Winery – This award winning winery is based on French wine, and it’s one of Swan Valley’s newest. Whistler’s Chocolate Company – What better way to end a wine tour than with chocolate? Following the winery tour, we’ll take you back to either Perth or Guilford, to the pickup locations from the morning. Our goal on Top Gun Tours is to provide you with a friendly, relaxing day. That’s why we go a step beyond providing safe and reliable transportation, and add a high quality, professional luxury tour bus, featuring tinted windows, air-conditioning, high-back plush seats, seat belts, and style. Less than 30 minutes from leaving the Perth departure point, we’ll already be out of the city and at our first winery. When are the winery tours? Winery tours operate from 10:00 a.m. until approximately 5:00 p.m. on Tuesdays, Thursdays and Saturdays. What do wine tours cost? All of our wine tours are all inclusive, and they cost $124.00 (AUD) per person. Our Swan Valley wine tours include luxury transportation from either Perth or Guilford to five wineries, vineyards and food stops in Swan Valley, as well as all wine tastings, snacks, and a two course meal at Mandoon Estate. Touring with us also includes discounts at some of our stops! Interested in our Perth Wine Tours? Book a wine tour with us today! You can use the contact form on our website, or if you prefer, you can call us too. We look forward to seeing you soon!